The Arctic, we are told, is the canary in the climate coal mine. No place on the planet is supposed to warm faster. As global warming takes hold, we are really supposed to see it at the Earth’s poles. If that’s true, then we should really be opening up our minds to the real possibility of a cooling planet because summertimes at the North Pole are cooling. Three of the last five Arctic summers have been the coldest on record. Graphics snipped from the dmi.dk. Arctic summers can be examined going back to 1958 using data from the Danish Meteorological Institute here. It turns out the 3 coldest Arctic summers have all occurred in the last 5 years. Not even the summers of the 1960s were colder. 2013 still has about three weeks to go, yet the forecasts show that it’s place in the record books is pretty much secured. So why has Arctic sea ice extent reached record lows over the past 5 years, we might ask? Sea ice melt involves a lot more than just surface atmospheric temperature. Historical records show that a major force is ocean cycles. 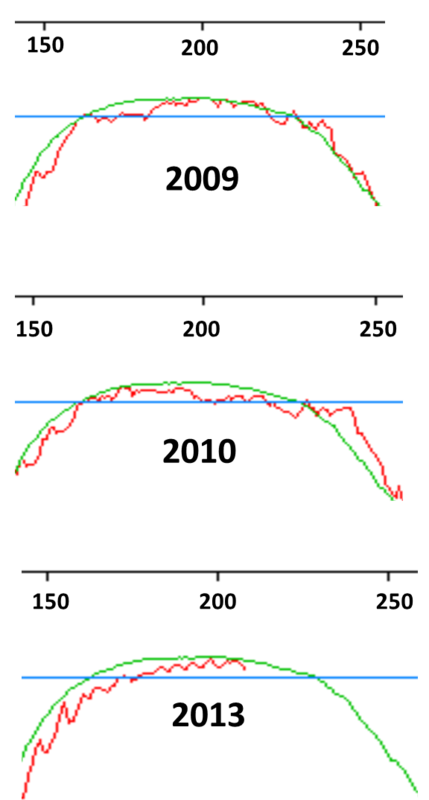 From 1980 to 2000, both the AMO and PDO saw warm phases, and so the Arctic ice melt was likely caused by the warmer surface sea water. But now that the PDO has flipped to its cool phase and the AMO is transitioning to its cool phase, we can expect the Arctic to begin its recovery over the next 2 decades – just like it did during the 1950s and 60s. There’s likely a decade or so lag between Arctic surface temperatures and sea ice coverage. I’d bet a good bottle of Scotch that we’ll be seeing a rising Arctic sea ice trend over the next 10 years. Finally, not only the North Pole is chilling out, but so is the South Pole, which has been setting record highs for sea ice extent. See here. Actually we have been cooling for the last 82 million years already. Back then the deep oceans were ~17K warmer than today, and we had forests on Antarctica. Occasionally we encountered a little warming, but the general trend was cooling at on average 1K every 5 million years. No wonder we are in an era with ice ages. The ice buoys above 80 degrees and in the Bufort Sea are all now below freezing. You could win the Arctic sea ice trend bet as this year looks so far as one of them. If the winters are colder yet the sea ice is melting, what is the state of the glaciers at this point? Are they still retreating or are they reforming? The winters remain well below freezing? Is that why the ice shrinks? You are not making sense. Please clarify. I will clarify. The arctic winter temperature is well below freezing. It therefore seems illogical to attribute loss of ice to below-freeaing temperatures. If, however, your comment is aimed at Zoyx, I would think that he/she is simply a mindless troll who has wandered on to your site. I would not expect much logic from him/her. One could argue that sea ice forms only at -15 deg C or so (but melts at 0 deg) – reason being that salt must be pushed out of solution first. So higher than normal temperature in winter could lead to slightly less new ice formation. Sea water at typical salinity (3.5%) freezes at -2C. For each 1% increase in salinity, the freezing point drops about 1C. In theory, higher winter temperatures, even if below the freezing point, could lead to thinner ice formation, but would also probably tend to increase the snowfall amount on top. Zoyx; Pierre is an evil denier and shows only small snippets of sea ice graph to mislead people. That is also the reason why he doesn’t have a column of “climatic indicators” links on the right sidebar. The Arctic has recovered before. See below for the 1920s and 1930s ‘warming’. Here in central Washington State we have had hot and dry for a few weeks. I’ve heard old-timers call this period Summer. If you don’t mind, send a little of that “cool” our way. Cheers. With all this fresh ice, how come the BBC gets away with running stories about new shipping lanes over the pole revolutionising sea transport?